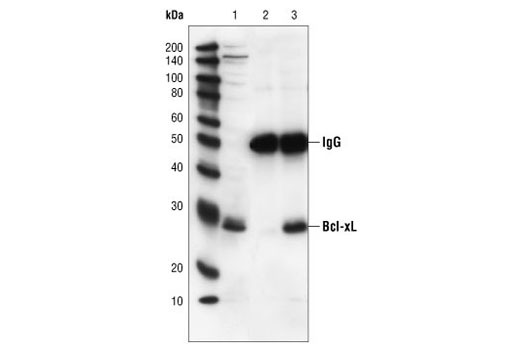 Western blot analysis of extracts from various cell lines using Bcl-2 (D55G8) Rabbit mAb (Human Specific). Western blot analysis of extracts from Jurkat cells, untreated or treated with paclitaxel (1 μM, overnight) and with or without λ phosphatase, using Phospho-Bcl-2 (Ser70) (5H2) Rabbit mAb (upper) or Bcl-2 #2876 (lower). 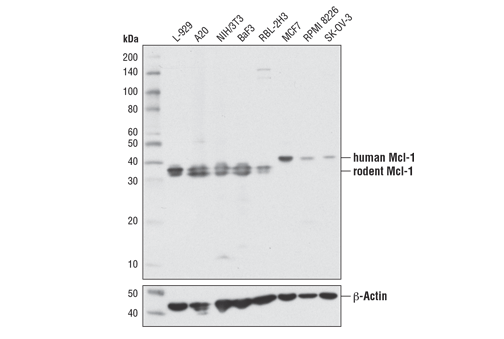 Western blot analysis of extracts from 293T cells, mock transfected or transfected with a construct expressing full-length human Mcl-1 (hMcl-1; +) or mouse Mcl-1 (mMcl-1; +), using Mcl-1 (D2W9E) Rabbit mAb. 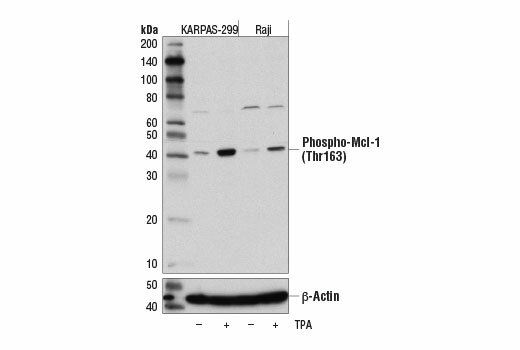 Western blot analysis of extracts from KARPAS-299 and Raji cell lines, untreated (-) or treated with TPA #4174 (200 nM, 30 min; +), using Phospho-Mcl-1 (Thr163) (D5M9D) Rabbit mAb (upper) and β-Actin (D6A8) Rabbit mAb #8457 (lower). KARPAS cell Line source: Dr Abraham Karpas at the University of Cambridge. 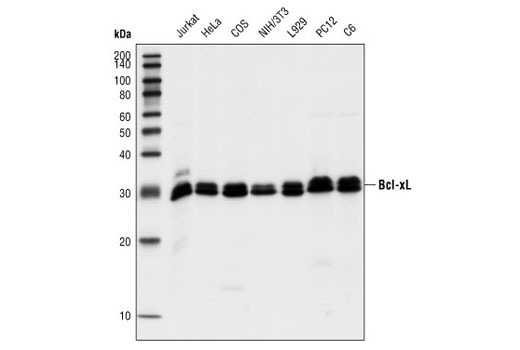 Western blot analysis of extracts from Jurkat and HeLa (human), COS (monkey), NIH/3T3 and L929 (mouse), and PC12 and C6 (rat) cells, using Bcl-xL (54H6) Rabbit mAb. 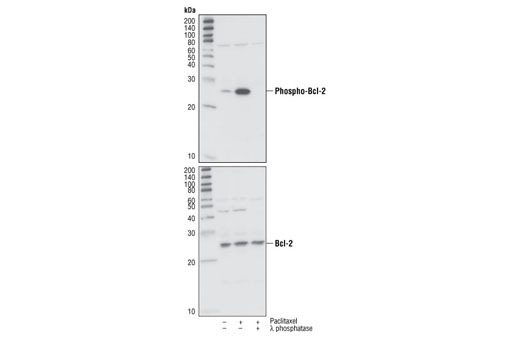 Western blot analysis of extracts from 293T cells, mock transfected (-) or transfected with a construct expressing full-length human A1/Bfl-1 protein (hA1/Bfl-1; +), using A1/Bfl-1 (D1A1C) Rabbit mAb. 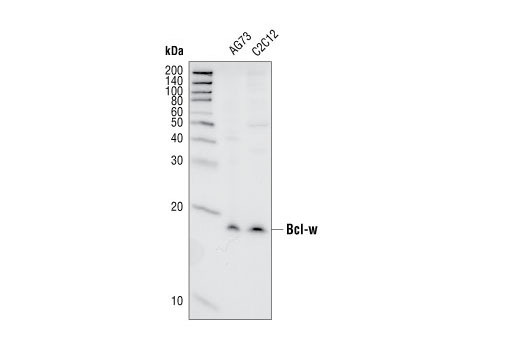 Western blot analysis of extracts from A673 and C2C12 cell lines, using Bcl-w (31H4) Rabbit mAb. Flow cytometric analysis of Jurkat cells, using Phospho-Bcl-2 (Ser70) (5H2) Rabbit mAb versus propidium iodide (DNA content). Western blot analysis of extracts from various cell lines using Mcl-1 (D2W9E) Rabbit mAb (upper) or β-Actin (D6A8) Rabbit mAb #8457 (lower). Immunoprecipitation of phospho-Mcl-1 (Thr163) from KARPAS-299 cells treated with TPA #4174 (200 nM, 30 min) using Rabbit (DA1E) mAb IgG XP® Isotype Control #3900 (lane 2) or Phospho-Mcl-1 (Thr163) (D5M9D) Rabbit mAb (lane 3). Lane 1 represents 10% input. 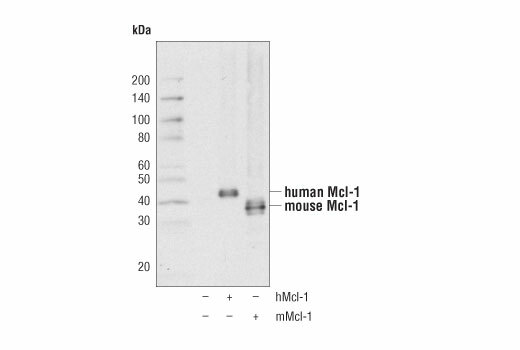 Western blot was perform using Phospho-Mcl-1 (Thr163) (D5M9D) Rabbit mAb. Mouse Anti-rabbit IgG (Conformation Specific) (L27A9) mAb #3678 was used as a secondary antibody to avoid cross reactivity with IgG heavy and light chains. KARPAS cell Line source: Dr Abraham Karpas at the University of Cambridge. Western blot analysis of extracts from HeLa cells, transfected with 100 nM SignalSilence® Control siRNA (Unconjugated) #6568 (-), SignalSilence® BcL-xL siRNA I (+) or SignalSilence® Bcl-xL siRNA II #6363 (+), using Bcl-xL (54H6) Rabbit mAb #2764 (upper) or α-Tubulin (11H10) Rabbit mAb #2125 (lower). 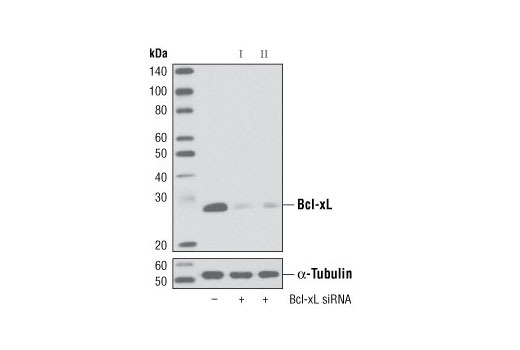 The Bcl-xL (54H6) Rabbit mAb confirms silencing of Bcl-xL expression, while the α-Tubulin (11H10) Rabbit mAb is used as a loading control. 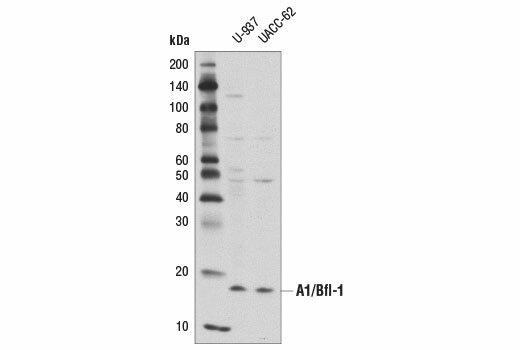 Western blot analysis of extracts from U-937 and UACC-62 cells using A1/Bfl-1 (D1A1C) Rabbit mAb. 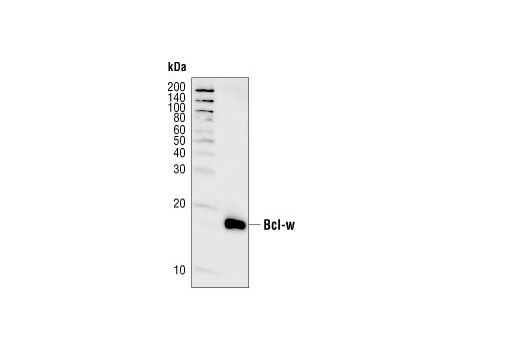 Western blot analysis of recombinant Bcl-w (amino acids 1-172) using Bcl-w (31H4) Rabbit mAb. Confocal immunofluorescent analysis of SH-SY5Y cells using Phospho-Bcl-2 (Ser70) (5H2) Rabbit mAb (red) and Phospho-Histone H3 (Ser10) (6G3) Mouse mAb #9706 (green). Blue pseudocolor = DRAQ5® #4084 (fluorescent DNA dye). Immunoprecipitation of Mcl-1 from MCF7 cell extracts. Lane 1 is 10% input, lane 2 is Rabbit (DA1E) mAb IgG XP® Isotype Control #3900, and lane 3 is Mcl-1 (D2W9E) Rabbit mAb. 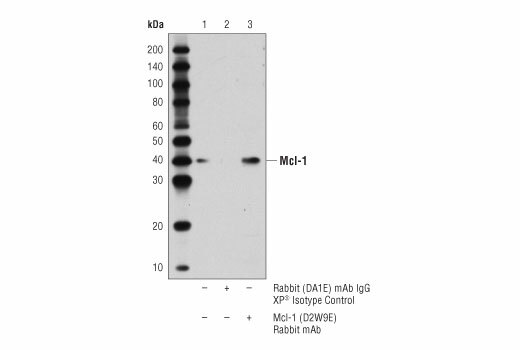 Western blot analysis was performed using Mcl-1 (D2W9E) Rabbit mAb. A conformation-specific secondary antibody was used to avoid cross-reactivity with IgG. Immunoprecipitation of Bcl-xL from Jurkat cell extracts, using Bcl-xL (54H6) Rabbit mAb. Lane 1 is the lysate control, lane 2 is antibody alone and lane 3 is antibody plus lysate. Flow cytometric analysis of SK-OV-3 cells (blue) and MCF7 cells (green) using Mcl-1 (D2W9E) Rabbit mAb. Anti-rabbit IgG (H+L), F(ab')2 Fragment (Alexa Fluor® 488 Conjugate) #4412 was used as a secondary antibody. 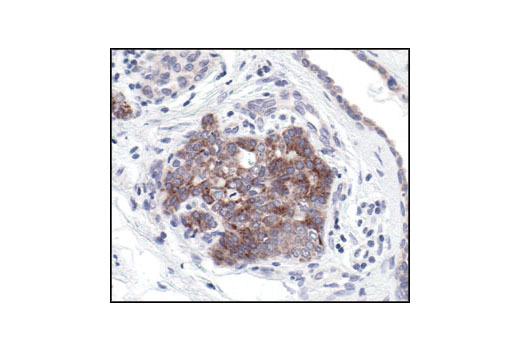 Immunohistochemical analysis of paraffin-embedded human lung carcinoma, using Bcl-xL (54H6) Rabbit mAb. Flow cytometric analysis of L-929 cells using Mcl-1 (D2W9E) Rabbit mAb (blue) compared to concentration matched Rabbit (DA1E) mAb IgG XP® Isotype Control #3900 (red). Anti-rabbit IgG (H+L), F(ab')2 Fragment (Alexa Fluor® 488 Conjugate) #4412 was use as a secondary antibody. 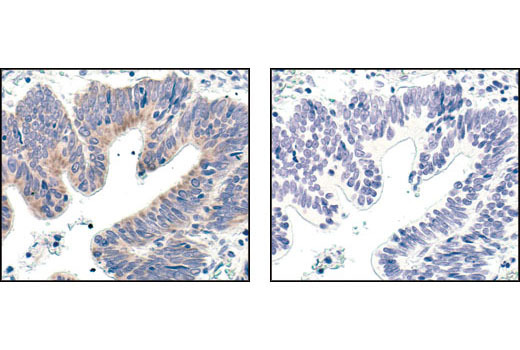 Immunohistochemical analysis of paraffin-embedded human colon carcinoma, using Bcl-xL (54H6) Rabbit mAb in the presence of control peptide (left) or Bcl-xL Blocking Peptide #1225 (right). Confocal immunofluorescent analysis of MCF7 (left), L-929 (center), and SK-OV-3 (right) cells using Mcl-1 (D2W9E) Rabbit mAb (green). Actin filaments were labeled with DyLight™ 554 Phalloidin #13054 (red). Blue pseudocolor = DRAQ5® #4084 (fluorescent DNA dye). 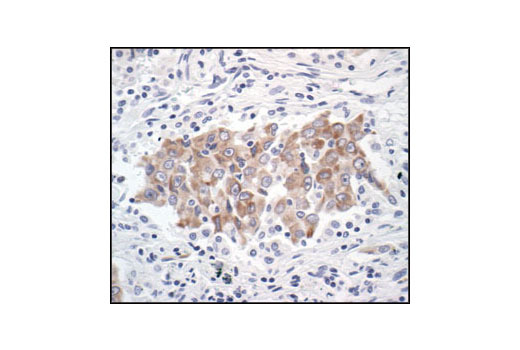 Immunohistochemical analysis of paraffin-embedded human prostate carcinoma, showing cytoplasmic localization, using Bcl-xL (54H6) Rabbit mAb. 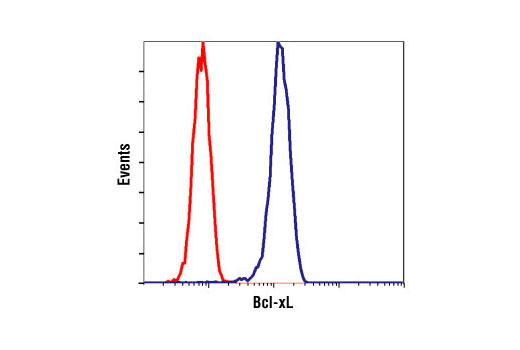 Flow cytometric analysis of untreated Jurkat cells, using Bcl-xL (54H6) Rabbit mAb (blue) compared to a nonspecific negative control antibody (red). 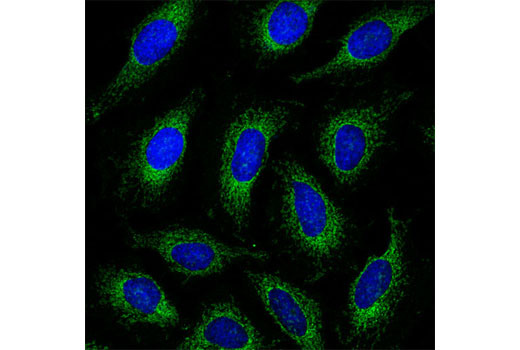 Confocal immunofluorescent analysis of HeLa cells using Bcl-xL (54H6) Rabbit mAb (green). Blue pseudocolor = DRAQ5® #4084 (fluorescent DNA dye). The Pro-Survival Bcl-2 Family Antibody Sampler Kit II provides an economical means to examine several members of the Bcl-2 family. 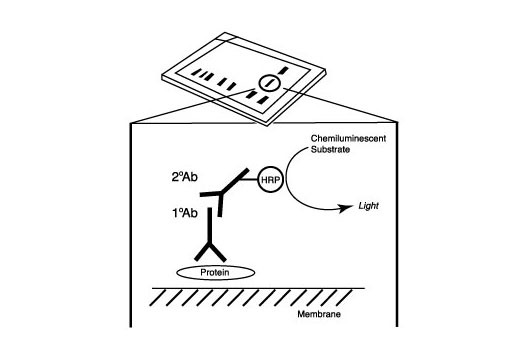 The kit contains enough primary antibody to perform two western blot experiments. Each antibody in the Pro-Survival Bcl-2 Family Antibody Sampler Kit II recognizes endogenous levels of its specific target. The antibodies do not cross-react with other Bcl-2 family members. 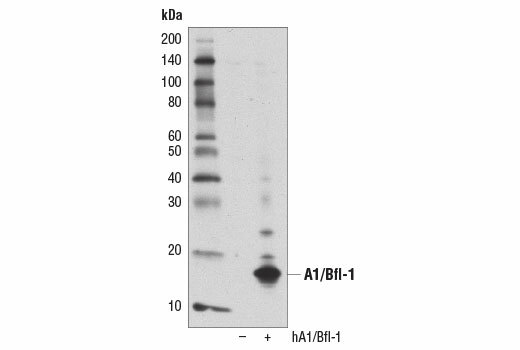 A1/Bfl-1 (D1A1C) Rabbit mAb may cross-react with an unknown protein at 50 and 130 kDa in some cell lines. 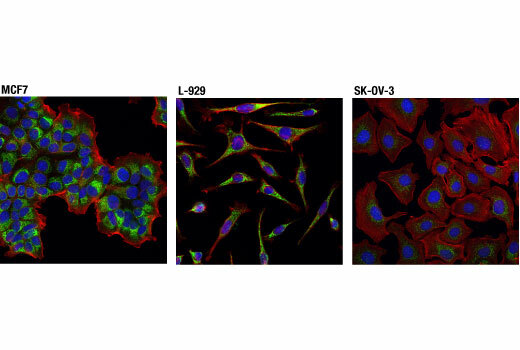 Phospho-Bcl-2 (Ser70) (5H2) Rabbit mAb detects endogenous of human Bcl-2 only when phosphorylated at Ser70. 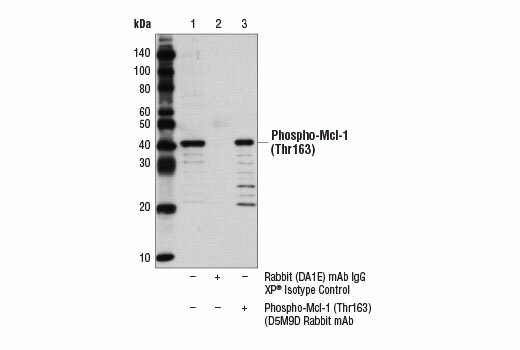 Phospho-Mcl-1 (Thr163) (D5M9D) Rabbit mAb recongizes endogenous levels of Mcl-1 only when phosphorylated at Thr163. 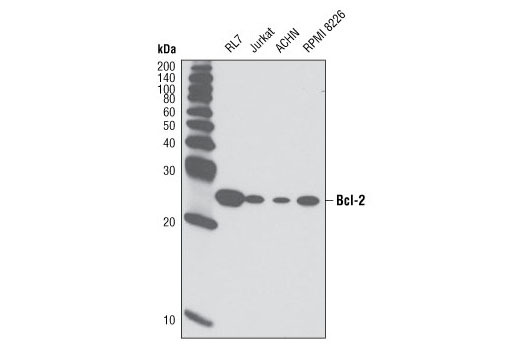 This antibody may also cross-react with an unidentified protein at 70 kDa in some cell lines. Rabbit monoclonal antibodies are produced by immunizing animals with synthetic peptides corresponding to residues surrounding Gly47 of human Bcl-2, Asp61 of human Bcl-xL, Pro60 of mouse Mcl-1, Gly29 of human A1/Bfl-1, and Ala39 of human Bcl-w. Phospho-specific rabbit monoclonal antibodies are produced by immunizing animlars with synthetic phospho-peptides correspoding to residues surrounding Ser70 of human Bcl-2 and Thr163 of human Mcl-1. The Bcl-2 family consists of a number of evolutionarily conserved proteins containing Bcl-2 homology domains (BH) that regulate apoptosis through control of mitochondrial membrane permeability and release of cytochrome c (1-3). Four BH domains have been identified (BH1-4) that mediate protein interactions. The family can be separated into three groups based upon function and sequence homology: pro-survival members include Bcl-2, Bcl-xL, Mcl-1, A1 and Bcl-w; pro-apoptotic proteins include Bax, Bak and Bok; and "BH3 only" proteins Bad, Bik, Bid, Puma, Bim, Bmf, Noxa and Hrk. Interactions between death-promoting and death-suppressing Bcl-2 family members has led to a rheostat model in which the ratio of pro-apoptotic and anti-apoptotic proteins controls cell fate (4). Thus, pro-survival members exert their behavior by binding to and antagonizing death-promoting members. In general, the "BH3-only members" can bind to and antagonize the pro-survival proteins leading to increased apoptosis (5). While some redundancy of this system likely exists, tissue specificity, transcriptional and post-translational regulation of many of these family members can account for distinct physiological roles. Several phosphorylation sites have been identified within Bcl-2 including Thr56, Ser70, Thr74 and Ser87 (6). These phosphorylation sites may be targets of the ASK1/MKK7/JNK1 pathway, and phosphorylation of Bcl-2 may be a marker for mitotic events (7,8). Mutation of Bcl-2 at Thr56 or Ser87 inhibits its anti-apoptotic activity during glucocorticoid-induced apoptosis of T lymphocytes (9). Interleukin 3 and JNK-induced Bcl-2 phosphorylation at Ser70 may be required for its enhanced antiapoptotic functions (10). Mcl-1 is phosphorylated in response to treatment with phorbol ester, microtubule-damaging agents, oxidative stress, and cytokine withdrawal (11-14). Phosphorylation at Thr163, the conserved MAP kinase/ERK site located within the PEST region, slows Mcl-1 protein turnover (13) but may prime the GSK-3 mediated phosphorylation at Ser159 that leads to Mcl-1 destabilization (14). Cory, S. et al. (2003) Oncogene 22, 8590-607. Antonsson, B. and Martinou, J.C. (2000) Exp Cell Res 256, 50-7. Sharpe, J.C. et al. (2004) Biochim Biophys Acta 1644, 107-13. Korsmeyer, S.J. et al. (1993) Semin Cancer Biol 4, 327-32. Bouillet, P. and Strasser, A. (2002) J Cell Sci 115, 1567-74. Maundrell, K. et al. (1997) J Biol Chem 272, 25238-42. Yamamoto, K. et al. (1999) Mol Cell Biol 19, 8469-78. Ling, Y.H. et al. (1998) J Biol Chem 273, 18984-91. Huang, S.T. and Cidlowski, J.A. (2002) FASEB J 16, 825-32. Deng, X. et al. (2001) J Biol Chem 276, 23681-8. Domina, A.M. et al. (2000) J Biol Chem 275, 21688-94. Inoshita, S. et al. (2002) J Biol Chem 277, 43730-4. Domina, A.M. et al. (2004) Oncogene 23, 5301-15. Maurer, U. et al. (2006) Mol Cell 21, 749-60. SignalFire is a trademark of Cell Signaling Technology, Inc.
LumiGLO is a registered trademark of Kirkegaard & Perry Laboratories.